Manual comma separation versus the cool CommaDelimitedStringCollection class! Some time back while looking around for something else, I was stumbled upon this class, and I simply enjoy using it! A "wow"-class; I would say. Though, not a lot of documentation is available, but it is worth using this class for those who frequently manage in-memory data with lists/arrays/etc. str +=ctl.Items[j].Text + ",";//make it comma separated. str.Remove(str.ToString().Length - 1, 1); //remove the last extra comma. I reset the clock once again, and start to focus on an activity out of my todo list, then I feel hunger, then I realize I need to make an important call, and I also was just thinking that I want to check my favorite online forum, and then I must read my email and also reply "immediately"... and oh! it has been years I updated by blog - today is the day; and that’s not to mention the most recurring of all my instincts — refilling my tea cup whenever its empty... while 'shedding some light' about the daily-rumours! Is it? Isn't it? So true... in this overwhelming ever expanding information-village. So how could we manage time? So challenging! I have been using Microsoft’s Data Access Application Block for windows forms; and this time I plan to use ‘em in my ASP.NET project. I tend to like application block framework, mostly because for me it saves a lot of time and it provides a bug free code. I mean seldom you feel a need to write your own data layer unless otherwise is explicitly required/demanded. So I get more time to think about my applications’ logic. Just for those who have no idea what a data access application block is, following would reveal the before-and-after scenarios; and how it can push you into the “flow” that we seek during our development phase. Following the code that create, and opens a connection, make a query, load the data into result and then binds it to the grid. Following does the same as above but with lesser code. The Data Access Application Block simplifies many common data access tasks such as reading data for display, passing data through application layers, and submitting changed data back to the database system. It includes support for both stored procedures and in-line SQL, and provides access to the most often used features of ADO.NET in simple-to-use classes. Using a DataReader or DataSet to retrieve multiple rows of data. Executing a command and retrieve the output parameters or a single-value item. 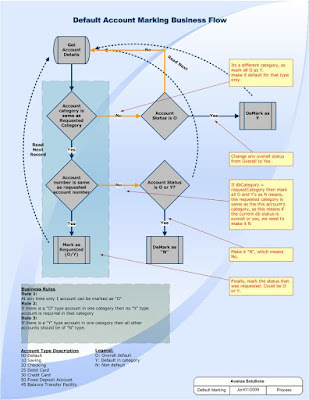 Performing multiple operations within a transaction. Retrieving XML data from a SQL Server. Updating a database with data contained in a DataSet object. Adding or extend implementations of database providers. You need simplicity and convenience while helping developers use the functionality provided by ADO.NET with best practices. You need to reduce the requirement for boilerplate code to perform standard data access tasks. You need to maintain consistent data access practices, both within an application and across the enterprise. You need to make it easy to change the target database type through configuration, and reduce the amount of code that developers must write when they port applications to different types of databases. You need to relieve developers from learning different programming models for different types of databases. The Data Access Application Block is a complement to ADO.NET; it is not a replacement. If your application must retrieve data in a specialized way, or take advantage of features specific to a particular database, consider using ADO.NET directly. Download; you may download the msi from here. Reference to assembly; add reference to the Microsoft.ApplicationBlocks.Data.dll assembly and start using Microsoft.ApplicationBlocks.Data. MSDN; Also go through the Data Access Application Block documentation at Microsofts website. Btw, v5.0 is still(as of now); under construction. Following is one way of enumerating the Picklist items to find match on Picklist.Name public property. The picklist values are in the retrievedAttributeMetadata.Options collection. To do this we will need to get the attribute metadata from the meta dataservice. This is a four step process. ..:: Dil hi to hai ::..
Why is it that in some organizations, staff do not follow(or should I say "avoid"?) the process/es defined and implemented by the management? Well, think about it! I believe following three the major factors. Generally, a process is avoided because of its complexity. The more complex the process, the chances are that the process shall be avoided. For example, our Passport office; I would give my passport fee + services fee to a chacha sitting right in front of the passport office, but won't try to step into the passport office gate. This is a common, experience'able example. Based upon above DATATYPE field, we need to generate controls; and in case of Date, we have a user control (WebUserControl) called UCtlCalendar control that we need to generate and keep track of. IE8 is whacked, they say!!! For some reason while browsing a message was popped up asking if I would want to install the “latest-fastest-greatest” Microsoft Internet Explorer 8? Well, I thought for a while and then I clicked on the OK button. It took around 10 minutes for the application to down and 10 more minutes to get the installation complete; but that not it, because it also requires you to restart your pc. I stumbled into size limitations while specifying VARCHAR(MAX) in C# code. Following two options can be the C# alternative to VARCHAR(MAX) or NVARCHAR(MAX) that I have tried for SQL Server 2005. Lets go step by step and verify as well. 2b) Or donot specify any column size. Verify the length of the data. The above shall give the length of the data. I have tried it with 7999 bytes, 8000, 8001, and 10000 bytes. Basically, VARCHAR and NVARCHAR comes in Large-Value Data Types. NVARCHAR supports Unicode characters which means a wider "range" of characters/code pages. And since its Unicode therefore a single character is stored on two bytes; which inherently means NVARCHAR is twice the size of VARCHAR. While VARCHAR stores one char per byte; and the problem with data types that use one byte to encode each character is that the data type can only represent 256 different characters. The following table shows the relationship between the large -value data types and their counterparts from earlier versions of SQL Server. Note that, TEXT, NTEXT, and IMAGE data types are now a deprecated data types. Use char when the sizes of the column data entries are consistent/same. Use varchar when the sizes of the column data entries vary considerably; that is the max and minimum amount of length is known. A table can contain a maximum of 8,060 bytes per row; but this restriction does not apply to varchar(max), nvarchar(max), varbinary(max), text, image, or xml columns. You can use the large-value data types, i.e. the MAX value, to store up to 2^31-1 bytes of data; precisely 2147483648 – 1 bytes; approximately 2 GB. The lifestyle and thoughts of Hazrat Ali has always been a source of motivation in my life; Probably mostly because I heard alot of stories of the Might, and Kindness, and Bravery, and his Thoughtfulness. There is this famous story that used to roam around us all the time when we were young: Once, a man came to Hazrat Ali and questioned that exactly how much control do we have on our lives? Hazrat Ali smiled thoughtfully, and asked him to stand and fold one of his leg; The man followed, and looked at Hazrat Ali as to how this is going to answer his question; Harzat Ali said; fold your other leg. The man wondered, puzzled, said he cannot do that. Thats about it, thats all the control that you have on your life. All it means, that everything, basically every "Result", is based upon effort. The more the effort, the better the effort, the more "Managed-Effort", the more well-planned-effort, the more predictable-obvious-desireable-result. And if, after well planned effort, you did not get the desired-result, so according to Hazrat Ali, that is out of the control of our life. Thats where the "Fate" comes in. I donot have to do anything and that I "cannot-do" anything about it. Exactly like the man who couldnt fold the other leg at the same time, otherwise he would fall down. And the good thing is that atleast he tried; otherwise he wouldnt have known. And I believe in effort. Result is the outcome of the effort. "Fail to plan, plan to fail". Obviously I am talking about "normal" human beings, and not the especial-exceptional-cases. ~ poochay hain kay maula, ye taqdeer kya bala? kehtay hain kay koshish mein hai taqdeer bas chupi. ~ jana meray maulna nay, Rehman ko tabhi. iraadon kay tootnay pay tadab'bur kiya jabhi! How bypass integrated authentication using WebBrowser control? Well, sometime back, I was hosting the WebBrowser control over WinForm and I wanted to access a remote/secure(https) website; The website was throwing a windows authentication dialog box whenever the url was typed in. This started bugging me and my program as well; since I wanted my program to automate this behavior and provide the credentials “hautomatically” (handle-automatically :0) So I told myself, issues are sweet, that’s how you get to learn more; Lets get sweetened! Now the question was how to provide integrated authentication while having no access to the site, that is, my integrated windows credentials are not valid for the remote site; So how to force a different credential(other than the logged in one) plus override the WebBrowser credentials popup prompt. STEP 1: Create a plain windows form application, double click over the form in design more to implement its OnLoad event. ...and well, hit the Run! Please download the zipped solution (.SLN) from here. Thanks to Eduardo for his feedback. There are four types of authentication, Windows, Forms, Passport, and None. Usual use is of the forms based authentication and integrated windows authentication (IWA). My scenario obviously had an integrated authentication system; and the logged in user is popped up with a window for required credentials. Fig 3: [Illustration by IBM] A generic authentication flow. IAuthenticate, is used by the WebBrowser object to automatically retrieve the user credentials and provides it to the website upon request. Urlmon.dll uses the QueryInterface method on the client application's implementation of IBindStatusCallback to get a pointer to the client application's IAuthenticate interface. If the client application is hosting Mshtml.dll, Mshtml.dll requests a pointer to the client application's implementation of IAuthenticate interface by calling QueryInterface on the client application's IServiceProvider interface. 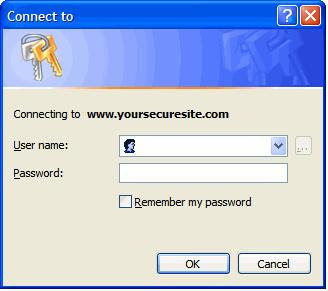 IOleClientSite, is used to notify the WebBrowser about the website that is going to require the credentials. Within a compound document, each embedded object has its own client site — the place where it is displayed and through which it receives information about its storage, user interface, and other resources. IOleObject::SetClientSite is the only method enabling an embedded object to obtain a pointer to its client site. A container can notify an object of its client site either at the time the object is created or, subsequently, when the object is initialized. The IServiceProvider interface is a generic access mechanism to locate a GUID-identified service that is provided through a control or any other object that the service can communicate with. For example, an embedded object (such as an OLE control) typically communicates only with its associated client site object in the container through the IOleClientSite interface that is supplied by using IOleObject::SetClientSite. The embedded object must ask the client site for some other service that the container supports when that service might not be implemented in the client site. The client site must provide a means by which the control that is managed by the site can access the service when necessary. For example, the IOleInPlaceSite::GetWindowContext function can be used by an in-place object or control to access interface pointers for the document object that contains the site and the frame object that contains the document. Because these interface pointers exist on separate objects, the control cannot call the site's QueryInterface to obtain those pointers. Instead, use the IServiceProvider interface. The IServiceProvider interface has only one member, QueryService, through which a caller specifies the service ID (SID, a GUID), the IID of the interface to return, and the address of the caller's interface pointer variable. Note, that now, when we host the WebBrowser control and implement the IAuthenticate interface to programmatically bypass the authentication process, sometimes Internet Explorer does not call the Authenticate function, which causes an authentication dialog to appear. So, this is somewhat buggy. So, the workaround is to; "first" move to "about:blank" i.e. : Navigate("about:blank"), before moving to the secure site. //Notify the WebBrowser object about the client site. //This method returns an interface pointer that represents the requested interface on the specified object. It is particularly useful if you have an unmanaged method that expects to be passed an interface pointer; Add to the COM interface reference count. //Copies the contents of a managed String to a block of memory allocated from the unmanaged COM task allocator. This is for me, and for those who came across similar sweet issue. Hope this helps. Since I have looking into the XML schemas and validators, I was wondering about the differences between a DTD and XSD. Which one would we use when? And why? Following are a couple of differences that I am able to conclude. • DTD provides a basic grammar for defining a document(HTML/XML/etc); its elements, attributes, their nesting and ordering. • The language to define a DTD is called MNF; I forgot but it’s like Markus-Naum language. • Since the document is based upon xml standards, the normal xml parse is used to parse the xsd document. • Can define data types, elements, attributes, nestings, orderings, etc; and what the data can/cannot contain. • Since its based upon XML, I believe its easily learnable. • XML document has an XML Namespace to refer to and an XML DTD to define it. This becomes overhead when a parser examines the document, it may have to link this all in, interpret the DTD for the schema, load the namespace, and validate the schema; all before it can parse the actual XML document; this overhead may seriously degrade performance or system availability. If you like to look more, the Document Structure Description(DSD) defines the next generation schema languages, see examples. COR is a software coding practice used by the "Gang of Four". It comes under the behavioral category since for each request the behavior of the object would be different. A good example could be a Help software module; For instance there are three buttons, red blue and green , on a user interface. And for each button-click the system shall show a message box with the related helpful text. So, when red button is click the a help command is routed to each of the object on the user interface (all of the buttons and UI itself in this case) and that object is going to decided if it has to process the request or pass it on to the next object. Similar would be the case when the UI will be clicked; the message will route to all of the objects and would eventually be handled by the UI object. This promotes loose coupling between sender of a request and its receiver by giving more than one object an opportunity to handle the request. int nRequest = 1;//Could be 1 = multiply, 2 = divide, 3= add, etc. //STEP 3: Convert into characters, concat and return. Released on Mar 8th, an excellent resource was forwarded by a friend, is a software based open implementation of HSM, Hardware security module. The HSM simulator is a library that provides almost all of the functionalities offered by Thales HSM. Almost all means, that several commands were not implemented fully (like the PA-Load Formatting Data whose sole implementation task is to respond to the host application) or not at all (like commands that have to do with the IBM verification method). I was thinking about the rag’ra (pain) I had when I started learning about a domain that was entirely new me. 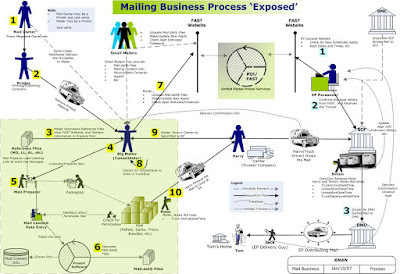 United States mailing supply chain industry has a very complex business process. And it would take several years for a newbie to understanding the ups and downs by leaps and bounds of this industry, in specific United States Postal Services aka USPS. Since I was hired to develop a solution that could ease the mailing industry business process, and help large and small mailers as well as consolidators. Software that would provide the ease of scheduling appointments with USPS with a click of a mouse; which I delivered gracefully. The day I left Assurety Consulting, I decided to add my 5 pints and document all of my mailing industry knowledge that I learned while developing solution, so that it could be helpful to someone who is in need. The reason business is so complex is its obscurity. You find almost no information how the mailing supply chain management business work in United States. You sure will need a seasoned “he” or “she” having more than 15 years of experience to guide you through the process; and wait, sometimes the seasoned-ones also stop and think and discuss and then reveals the business process. And when you get to learn these things, you find a lot of loops and holes along with a full throttle/burst of ideas/suggestions/fixes that sometimes are, again, bottle-necked by the process that this business industry follows for requesting a change. Although the process followed by MTAC for the change request is not bad; but what lacks is the interaction with small mailers/consolidators. They could, I believe, play a vital role to ease the business process and their requirements. I have been through the FAST Certification process several times; and we found a great deal of misleading in documentation and actual implementation while conducting USPS FAST CAT tests for TM v2.*. We even compiled a list of issues and non conformance and handed over the FAST. I shall write more on the mailing industry as I get time and share more of my knowledge and experience with the industry.